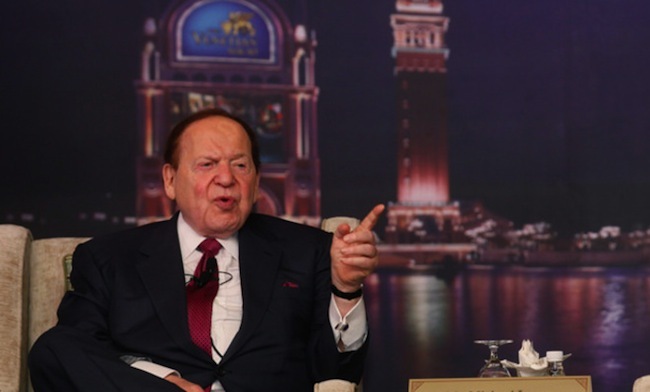 Sheldon Adelson, CEO Las Vegas Sands, doesn’t like online gaming and thinks it’s a cancer. Sheldon Adelson considers online gaming a gateway drug to the downfall of mankind. Adelson says he doesn’t want any money from online gaming. Ever. Now get off his lawn. He’s cranky! Sheldon Adelson is also probably not telling the truth. In the past couple years Las Vegas Sands has changed all of his poker rooms to be “Sands Poker Room” so that they can brand the poker rooms across the world to be the same. Las Vegas Sands isn’t branding everything the same. There are still Venetian’s and Sands’ and Palazzo’s around the world. But poker…that’s a streamlined brand. Here’s an interesting interview with Sheldon Adelson bashing online gaming on Bloomberg News. It’s almost 8 minutes long so save for when you have the time. The video doesn’t want to embed this morning. Maybe it needs more coffee too. you can watch it here. Shout out to @Detroit1051 for sharing this. Is the separation of casinos business and hotel business and retail business a good thing? Penn National thinks it’s good business. A few weeks ago they split their casino and hotel businesses into two separate companies. Penn National Gaming has announced that it will split itself into an operating company and a REIT. The casino properties will be cleft between the two entities, with Penn National leasing most of them from the REIT. A REIT is short for Real Estate Investment Trust. Separating the hotel and casino operations wasn’t only done because it may be good business, but it was also done to save in taxes. This sounds half like a sketchy big business avoiding taxes but also like smart business move that may provide better service to the customer on both the hotel and casino businesses. Service should become better since employees will be concerned with less and able to focus on creating better experiences. Penn National is the only company doing this right now, but Seeking Alpha thinks that seperating hotel, casino and mall business would be a good idea for Las Vegas Sands (LVS) (The Venetian & The Palazzo). LVS is known for its exceptional gaming and lodging brand, but the company’s value proposition is centered on three different (and integrated) business models: Malls, Lodging, and Gaming. Collectively, the company’s three platforms provide tremendous value, and individually, the pieces appear to be worth more than the whole. I don’t think that big businesses are always able look to the customer first. Take LVS, their priority is split between casinos, hotels and malls on multiple continents. Taking 2/3rds of the worry out of the hands of one person, for example, and handing it to 3 experts in different fields should help make each company operate better. Additionally if employee bonuses are tied to the performance of their individual company as opposed to all 3 divisions as one company there isn’t the ability to let focus go on a division. This should produce a better experience for the customer. On the surface, I think separating casinos from hotel and malls could be a good thing for everyone. I was doing my weekly catch up on Las Vegas news on Sunday when I saw a post on Wizard of Odds that made me cringe a little. A little background first. Wizard of Odds is my go-to for any gaming odds and strategy. I source their information often. In fact, when I wrote about where to find the best blackjack in Las Vegas for Vegas Chatter I used their information. I didn’t realize that Michael Shackleford worked at Las Vegas Sands (Venetian & Palazzo) until I read that he was no longer working there. Let it be known I am no longer working for the Venetian. It would be an understatement to say that my feelings about the termination are acrimonious. …I started with the Sands corporation on April 30, 2012. My job title was Director of Gaming Mathematics. Physically, I worked in the Venetian, but my job was at the corporate level, pertaining to all things table games in all the Sands casinos worldwide. 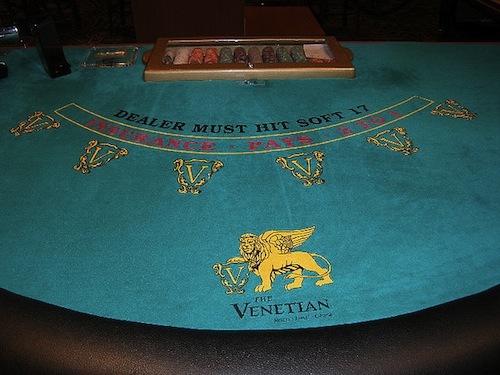 Venetian and Palazzo both have some of the best blackjack that you will find on the Las Vegas strip. Specifically, Palazzo is my favorite place to play blackjack on the Vegas strip. I’m not sure if Mr. Shackleford is the reason for the good blackjack, but I’m sure it didn’t hurt. The rest of their games are strip average at best. Venetian and Palazzo’s 3:2 blackjack dealt from a shoe for all denominations stand out from the Continuous Shuffle Machines at MGM properties and the 6:5 blackjack at Caesars properties. I hope Mr. Shackleford’s departure from Las Vegas Sands doesn’t mean that the blackjack will go away too. Even though I don’t know him I wish Mr. Shackleford the best. I love Vegas and you love Vegas, but does Wall-Street love Vegas? Maybe they don’t love Las Vegas. In a year-end review of MGM Resorts International’s stock price, The Motley Fool said that MGM’s poor performance was, in part, due to Las Vegas being a has-been gaming market. The first problem MGM faces is that it’s largely centered in Las Vegas, which has become the has-been of the gaming world. With rivals Las Vegas Sands (NYSE: LVS ) and Wynn Resorts (Nasdaq: WYNN ) increasingly focusing on the strong Asian gaming markets, MGM has to depend largely on the health of the Vegas Strip, where gaming wins have fallen steadily since their 2007 peak. While the take-away that Las Vegas is a has-been seems strong, it’s fairly accurate. The world is changing and so is where people gamble. In the past we’d see Wynn fly their Asian high roller to Vegas, but it’s much more economical for them just to fly to Macau where the player will still get signature Wynn service at a brand new casino. With 48 states making money from gambling and online gaming becoming legal in the future we will continue seeing casino companies diversify out of Las Vegas searching for new income streams. New York, Miami and Boston are among the major cities looking to expand their gaming in the next few years while Philadelphia already has a casino in the city while there are multiple options in the Philly suburbs. This is not to say Vegas won’t always rule our gambling vacation lives, but it is to say that there are other places inside and outside of the country that will be getting the attention that we’ve come to expect. I’ll have more thoughts on the future of comps, with this being the case sometime next year because there’s a lot to consider.